U.S. Secretary of State Hillary Rodham Clinton on Saturday warned Africa of a creeping “new colonialism” from foreign investors and governments interested only in extracting the continent’s natural resources to enrich themselves and not the African people. The point was directed at China. 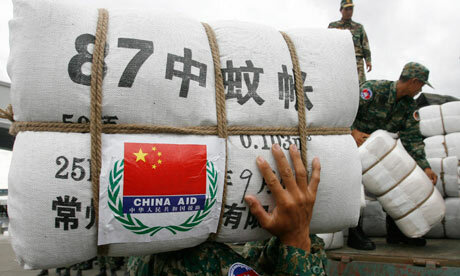 Chinese involvement in Africa is not clean, no doubt about that. Beijing’s support of the murderous regime in Khartoum is despicable. But this is nothing new. The US, Western Europe and Russia have done worse. The worst of all is the French who were in bed with the Rwandan army even as elements within it (Rwandan army) orchestrated the 1994 genocide. Many people that I have spoken to about Chinese involvement in Africa seem to have lots to complain about, but they also like Chinese pragmatism. They get the roads built, the fibre cables laid out, etc. I must say that Africans who are suffering under oppressive regimes still need western pressure on their governments to allow for more political space (however janus-faced this pressure might be). That said, Africa needs more options. A globally conscious China with lots of money to throw around will – in the long run – do more good than harm in Africa. Their resources-for-(white elephant)-projects approach might yet prove to be better than the previous resources-for-Swiss-bank-accounts approach of Western multinationals. And as has been the case with shady Western involvement in Africa, whenever the Chinese make deals that are bad for the locals the blame should be directed at the African governments who take side payments and look the other way. Here is a new blog on this by Brautigam. I attended her talk at Stanford and kind of liked the book. I am glad that a consensus seems to be emerging that one-sided and blind China-bashing is not productive, especially with regard to Chinese involvement in Africa. And in other news, what is Kagame up to? The man appears to be turning into a paranoid autocrat. It’s been 16 years since 1994 and about time he started being more open to constructive criticism. equatorial guinea, where does the money go? Equatorial Guinea is the third largest oil producer in Africa, right after Nigeria and Angola. Equatorial Guinea also has just over half a million people. It therefore defies logic that this country should still have many of its people living in squalid conditions. This country ranks 121st out of 177 on the UN Human development Index, even though it has a per capita income (PPP) of 50,200 (CIA Factbook) – only second to Luxembourg in the entire world! Why are many Equatorial Guineans still dirt poor, dying from treatable illnesses and ignorant? Where is Teodore Obiang Nguema Mbasogo taking all the oil money? This is a shame to the continent and to Obiang and his cronies. It is high time African leaders became their own keepers and fostered a culture of intra-continental competition rather than their old-school collusion to steal all they can from the poor and dying, as is happening in this fabulously wealthy country. This is especially important now that the EU and the US – because of competition for resources with China – have decided, like the latter, to turn a blind eye to gross injustices like this one. With a total population smaller than those of most African capitals, and with all the oil money, how hard can it be to keep track of everyone and ensure that all Equatorial Guineans are well fed, educated and healthy? So in the last few days there has been uproar in Europe over the ludicrous jailing of a British teacher in Sudan because she let her young students christen a teddy bear Mohamed ……. really Sudan, really? Luckily for the poor well-meaning lady the international attention that was generated by her arrest and the resultant embarrassment to the Sudanese top brass made the Bashir government decide to pardon her and have her taken back to the UK. This got me thinking, it is apparent – at least after this incident – that Bashir cares about what people outside Northern Sudan (East of Darfur) and China think of him. Just like embarrassment was used to put some sense into his administration about this teddy bear incident may be the international community can embarrass him with different kinds of stories about Darfur. Stories with a human face. A lot of the stories coming out of Darfur have mostly included blanket reports on atrocities and numbers of those dead and displaced but we have not yet had a well publicised story of a poor woman, named say Aisha, who may have been raped, had a village razed to the ground and then left to die by the Janjaweed but who mysteriously survived. May be after Bashir sees these human stories he might just be persuaded into accepting the fact that Darfur needs more attention than it is getting right now from Khartoum. As the world continues to call him names and antagonise him, Bashir might be growing even thicker skin and plugging his ears. What he can’t ignore, it seems, is an assault on his pride and his basic human sensibilities. I have focussed on Bashir but this could apply to all those involved in the atrocities in Darfur, including the men bearing the red flag from the East.